Ladies and gentlemen, I am direly in need of closure--the baby-safe kind. Call me a paranoid mom-to-be, but I don't feel safe/comfortable putting buttons or drawstrings on baby garments, especially not after taking my Infant CPR/First Aid class. 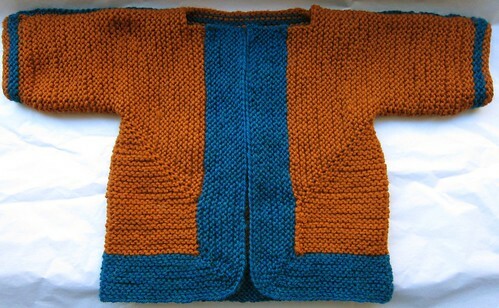 So I'm at a loss with how to finish the two cardigans I've knitted for Cartoonist Baby. Both are fabulous Elizabeth Zimmerman patterns from a less button-phobic era, and on both I ignored the directions about adding buttonholes. Pattern: Elizabeth Zimmerman's February Baby Sweater on Two Needles from Knitter's Almanac, made with some yarn I kettle-dyed a few years back. The yoke and borders are simple garter-stitch, and the lace pattern is a simple 7-stitch repeat. It's knit almost all in one piece--the only seams are under the arms. 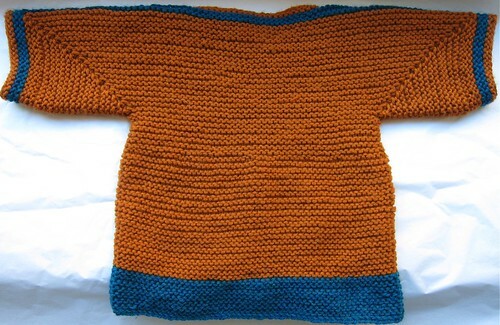 Sizing: The pattern sizing depends on gauge--it came out a bit on the larger size, I'm thinking about 9-12 months. Yarn/Needles/Notions: I used 1.5 balls of Knit Picks Swish Worsted Bare that I kettle-dyed pink a few years ago with size 4 circular needles (I'm a loose knitter). Modifications: None. Unless you count all the mistakes I made in the lace pattern that I fixed as I went along (or the fact that I reknit the first few rows three times before getting a hang of said lace pattern). Difficulty Level? : It's a simple pattern, but the instructions are so pithy that I had to do extensive internet forum searching to interpret them, especially when it came to the sleeves and underarms. 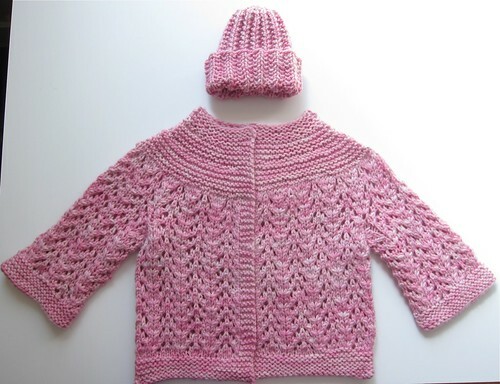 Pattern: Elizabeth Zimmerman's Baby Surprise Jacket from Knitting Workshop, It's all one piece knit in garter stitch. Sizing: The pattern sizing depends on gauge--similar to the lacy cardigan, I'd say mine is about 9-12 months. Yarn/Needles/Notions: I used 2.5 skeins of Knit Picks Swish Worsted Allspice and 1 in Marine Heather. (Same washable wool as the lacy cardigan). Modifications: None. Except for omitting the buttonholes. Difficulty Level? : It's a simple pattern, but it helps to use a row-keeper to keep track of where you are. Ravelry link with all the details. So: closures. I always put snaps on sewn baby garments, with interfacing underneath to stabilize the area. 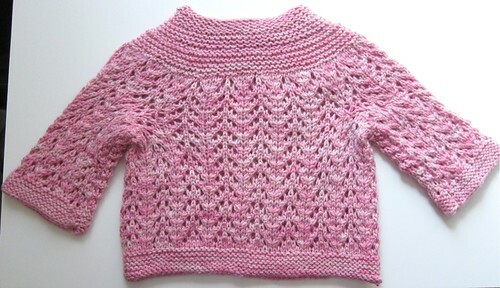 But I really haven't seen many baby SWEATERS with snaps--I don't know that they'd work with loose hand-knit fabric. Maybe I could sew some grosgrain ribbon inside the button bands to stabilize them? Or what about some kind of hook and eye treatment or some kind of frog closure... just one or two largish ones to keep the cardigans from falling off? P.S. 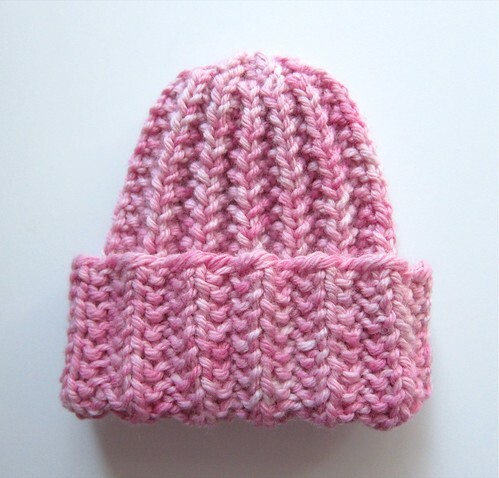 I actually knit up a little baby hat (the "Fool-Proof Baby Hat" from Clara Parkes' The Knitter's Book of Yarn) with the remainder of the yarn from the lacy baby cardigan... I figured Cartoonist Baby could wear home from the hospital. P.P.S. Oh, and obviously--yes, still pregnant. My official due date is Friday but my original date was last Wednesday... I can't say that I have a patient bone in my extremely pregnant body at this point, either. I'm well aware that every pregnancy is different and due dates are hardly deadlines, but I want my baby NOW! How about knitting a couple I-cords and making tie closures? I left closures off entirely until about 12 months - I just left everything as an open cardigan since there was always a little tee underneath. I thought of ribbon ties but even that worried me a bit. How about some snaps? They would definitely work on the pink top and probably a hook and eye would work better on the second top. If you use ribbon, beware, it is so slippery it constantly undoes, unless you knot it. How do I know... lol! Wishing you all the best with the birth of your baby, it's an exciting time!! These sweaters are precious! I was going to suggest snaps, but I like the frog idea, too. I understand about buttons and ties, I was kind of paranoid about that too. My only suggestions would be maybe a thin strip of baby velcro or one really large button at the top? I'd go for snaps too. They're so sweet. Cartoonist Baby is going to be meltingly adorable in her gear. Mmm. I agree that a detacheable, strong cord as a drawstring would be unwise. But buttons?? Really. Meg survived, along with millions of others, billions. A baby would have to be rather older than newborn to have the strength to rip them out. And as longs as the buttons are small enough to be swallowed rather than cause obstruction, you'll be fine. Relax. I'm really liking your knitting projects as of late - your babyknitting talk actually inspired me to buy a "Learn to Knit" book and some baby cashmere blend to knit for a new cousin who should arrive in August. I'm not doing too terribly, yet. I can't imagine how excited you must be about cartoonist baby coming! A long pregnancy is good, you're going to have a strong, smart, healthy baby! As a pediatrician, I laud your concern. Buttons are a choking hazard, and you'll feel better without the worry. Ties are an option, as long as they aren't long enough to wrap around baby, since that would obviously be a strangulation hazard. Snaps, if securely sewn, are probably your best closure option. Hooks would probably be safe, but might dig into baby when she's on her tummy. I actually vote with Sarah for no closures at all. I seldom used closures when my wee ones were small. You spend a lot of time taking off/putting on, so the easier, the better! I'm not a knitter, so I'm not exactly sure if this would work for you. I saw this tutorial on there a while back and you don't see many zipppers on sweaters, so it struck me as kind of cool. Thanks for the great ideas, everyone! Much appreciated. I'm leaning towards the "no closure" that Kid MD and Sarah @ colorkitten suggested, although maybe I will try a zipper on the baby surprise jacket--not sure why I didn't think of that before! Wow! I'm surprised that no one else liked the idea of some kind of frog closure. That is the one that sounded cutest to me. I've used short ties at the collar level for a baby cardigan. Don't even bother with i-cord, just twist strands of the yarn together firmly and then double back. Secure with a knot (to go on the wrong side), attach the tie to the sweater with the yarn tail. No drawstring, no choking hazard. If you followed the instructions for the Baby Surprise, I wouldn't bother with a closure at all. It always looked odd to me to have a closed-up sweater when the sleeves don't go past the elbow. I know it has been a few months since your post on these cute sweaters, but thought you may like my comment. 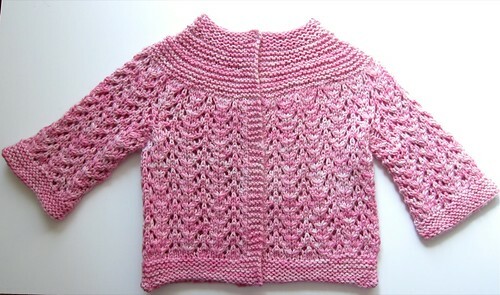 I just knitted a couple of slip over sweaters for a newborn who is already in 9 month size baby clothes. I left one of the shoulder seams open, and machine stitched a strip of snaps (you can buy it by the yard) at that open shoulder. You must be sure to place water soluble stabilizer on the underside while sewing so the yarn does not catch in the feed dogs. Well, by now your baby is a toddler. I happened across your post while looking for safe ways to button up sweaters for a grandchild-to-be. I've arrived at something that I think will work. I selected buttons with holes large enough to accommodate the sweater yarn, and a yarn needle that would accommodate the yarn and go through the holes--it is actually a tapestry needle. Mark the button placements on the wrong side of the work. Measure off about a yard of the yarn and cut it off. Use a size "C" crochet hook for DK weight yarn, and attach the length of yarn at the top edge of the sweater, wrong side, with a slip knot. Leave a workable tail. Work single crochets down into the fabric of the sweater until you get to the first marker. Leave one loop on your hook, put it out of the way, and thread the free end of the yarn through your needle. Bring the needle out to the right side at the marker, thread on your button, and stitch it twice to the sweater. Remove the yarn needle, return to the wrong side, and continue to single crochet until you get to the next marker. Just keep repeating til you get to the last button, then continue your single crochets down to the end of the sweater. I knotted my beginning and ending threads and tied them off before weaving the ends in. This seems to work well. The sweaters have been through the washing and blocking process, and the buttons are not going anywhere. I feel I've made the m part of the fabric of the sweaters.